The first thing to catch my eye was that it was from the fairly short-lived gallery that Raymond Williams had on Market Street. I shakily believe it was in the ’70s. I’d drop by now and then. I knew Ray casually; we were both artists. But the really interesting thing is that it was made by Ideal Rubber Stamps (later Office Supply) at 222 East Center Street, across (for many years) from Copeland’s Office Supply. I suspect that as Copeland’s eased out of the humdrum paper-and-pencil trade, Ideal took on more office supply merchandise. 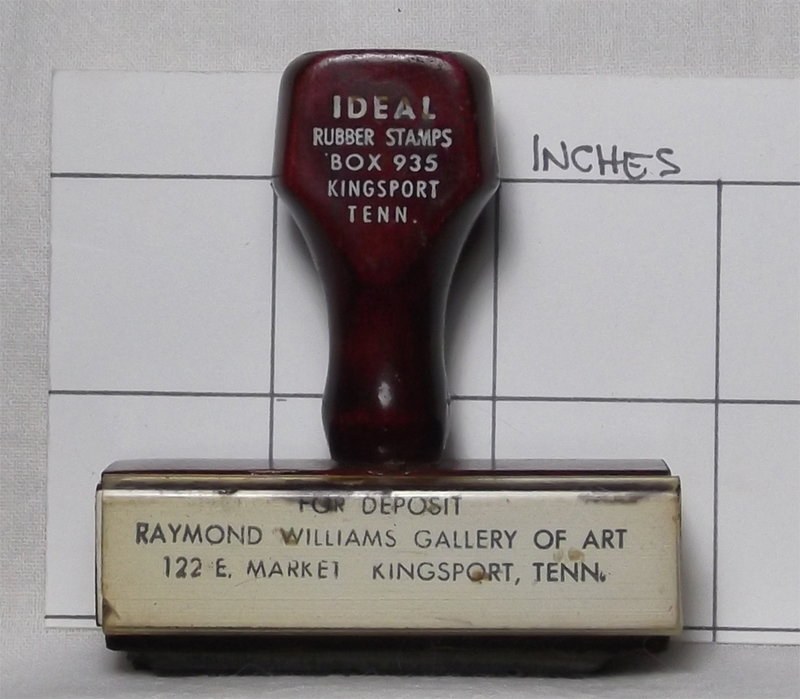 When I was at WKPT-TV, I was forever running over to Ideal with a purchase order to get Prestype transfer lettering for whatever sign or ad I was working on (I bowed down in gratitude when I got my first computer and printer at work)(I hated press type letters…only slightly less than I hated rubber cement). The company was incorporated in 1975 and is listed, as we well know, as “inactive”. But for a while, if you had a rubber stamp made, chances are Ideal did the deed. This entry was posted in Bob's photos and tagged Copeland's Office Supply, Prestype, Raymond William Galler of Art, wkpt-tv on September 19, 2016 by Bob Lawrence.